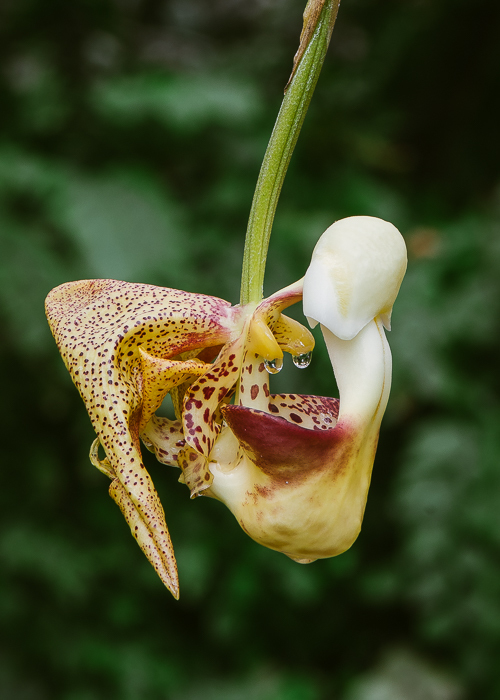 These days, 7 am finds me iphone flashlight in hand, visiting each greenhouse, searching the orchid collection for slugs, who I then crush under foot. This summer has brought an unusual amount of slug activity in all of our greenhouses, an unexpected development in the middle of a bright dry summer. They have made their way into pots and hanging baskets, eating root tips, new shoots, young flower spikes and flowers. 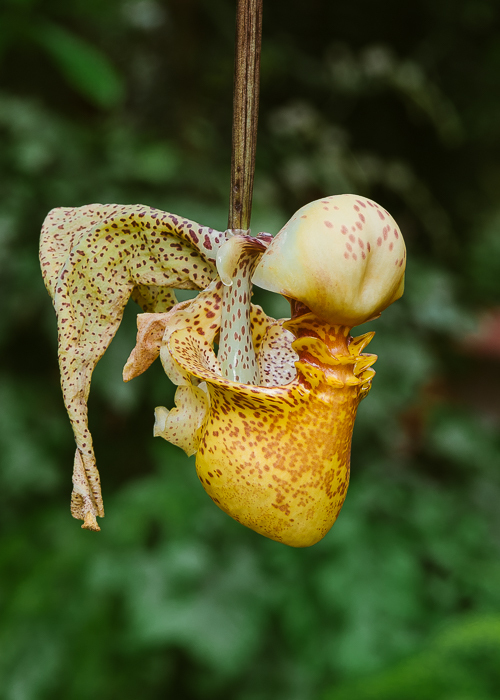 One triumph in our war on slugs has been among the Bucket Orchids (Coryanthes), usually a prime favorite of slugs, bush snails, cockroaches and practically any other pest you can name. Everybody, it seems, loves a Coryanthes. But this year the Coryanthes are producing flush after flush of absolutely pristine new roots and shoots. 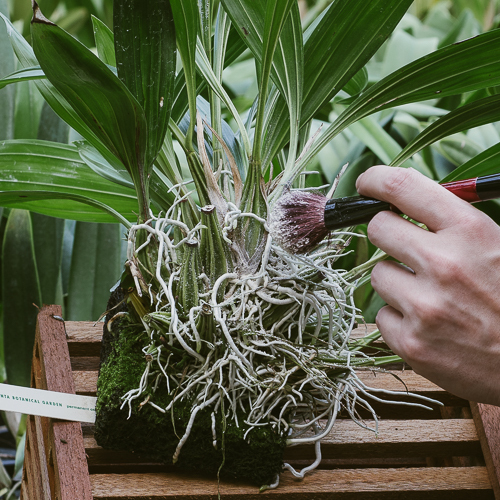 Our secret weapon: diatomaceous earth applied to bare root plants. Diatoms are unicellular algae with lots of silica in their cell walls. Silica is the major constituent of sand, but it is also found in living organisms. The fossilized remains of diatoms are mined from deposits in the western US, Canada and Germany. The granulated product has industrial uses in filtration systems. 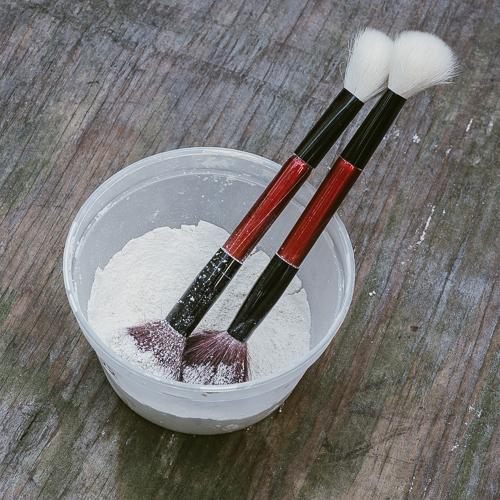 Diatoms can also be milled to create a talcum-like powder, called diatomaceous earth, which is abrasive, porous and hygroscopic (moisture absorbing). Diatomaceous earth kills insects and mollusks by abrasion and dehydration. We began our campaign against slugs on our Coryanthes two years ago. The battle plan had two phases: Remove their sanctuary and then apply treatment. First, we removed all of our Coryanthes from their pots and washed away the mossy medium and the slug eggs; then we mounted the plants on wooden rafts or tree fern slabs so that their roots were exposed and there were fewer places for mollusks to hide. We began applying diatomaceous earth to our Coryanthes at the height of the slug and bush snail season. Bush snails are tiny. Dozens can hide in the crevices between pseudobulbs. A good way to monitor slug and snail populations is to check the exterior of the raft an hour after watering. Before treatment, I found at least one slug and 10 to 50 bush snails on each wooden raft. We applied diatomaceous earth weekly throughout the spring and summer to the exposed roots, in between the pseudobulbs and to the leaves. This summer, after renewed applications, there are 0 to 2 bush snails per plant and no sign of chewing damage to root tips or leaves from slugs or cockroaches. We plant to continue applications through the autumn. Look for "Food Grade Diatomaceous Earth" in order to get freshwater diatoms. Avoid "Pool Grade," which is saltwater-derived. Keep the package sealed and out of the greenhouse or any other humid environment. The powder is highly porous and once it absorbs water from the atmosphere, it loses its ability to dehydrate pests. Wear a dust mask. Silica dust is harmful to lung tissue. 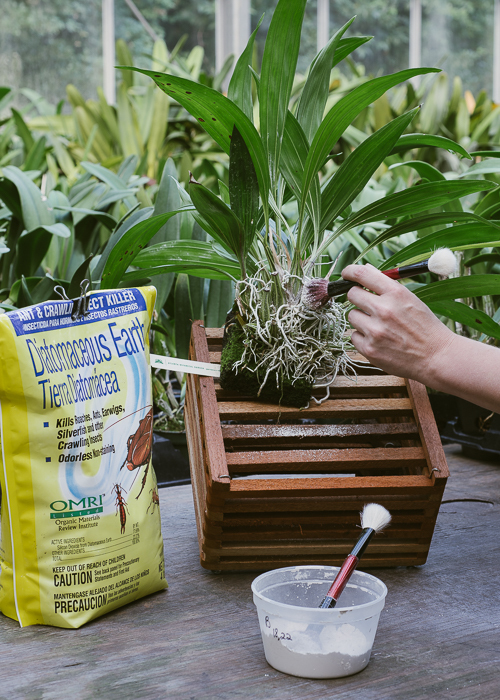 Apply diatomaceous earth once a week to the entire plant and its mount when the surfaces are dry: the new shoots, leaves, flower spikes, the slab and in between pseudobulbs. Let it sit at least overnight before you water again, since water will wash it away. Any soft brush will work as an applicator, but I like the idea of battling an enemy with a cosmetic brush. Drugstores carry them.